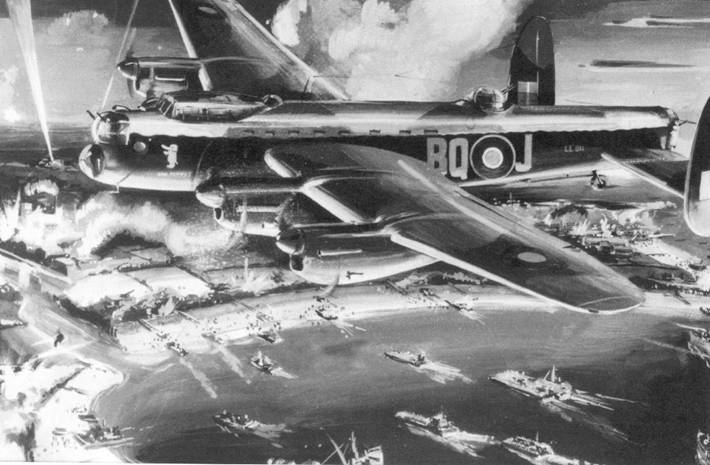 "At 24 minutes past eleven on the night of June 5, 1944 Lancaster LL811, J-Jig of 550 Squadron, from North Killingholme, dropped its load of 14 thousand pound bombs on a gun battery overlooking the Normandy coast. It was the opening salvo of Operation Overlord, the greatest amphibious operation in military history." So opens Chapter 16, "A Long Hot Summer" of 1 Group: Swift to Attack (Patrick Otter, Pen & Sword, 2012). 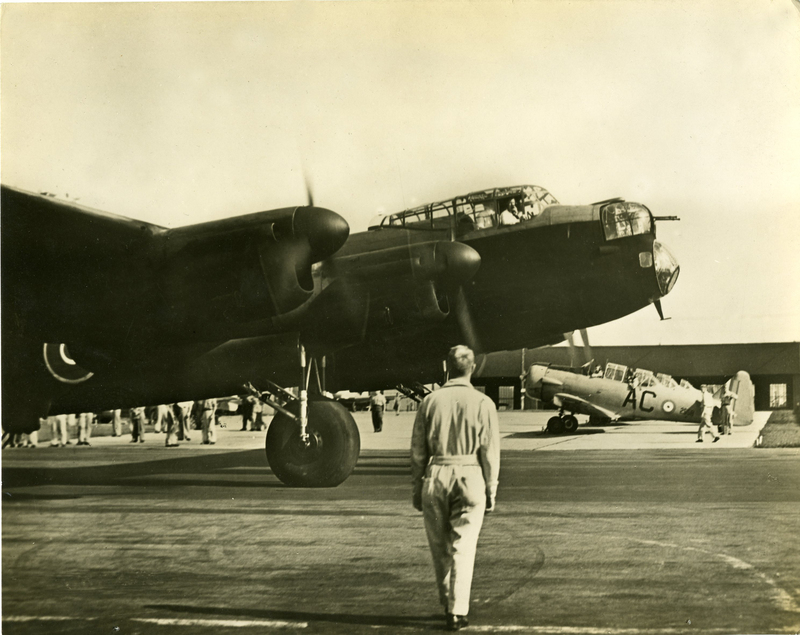 LL811, J-Jig, known as Bad Penny II, was flown by the F/O Bowen-Bravery crew, and is credited with opening the D-Day attack, commemorated in the picture below. 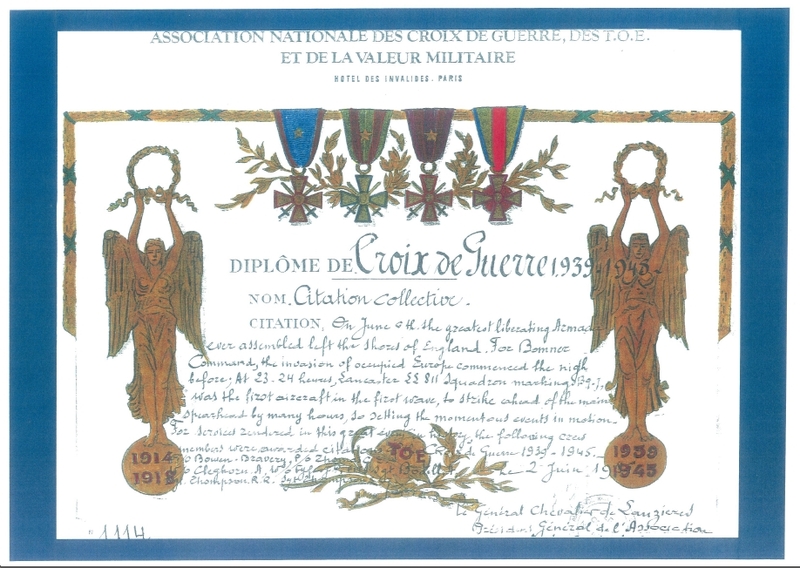 The Bowen-Bravery D-Day crew (Bowen-Bravery, Thompson, Thomas, Fyffe, Cleghorn, Bodill, Thompson) were awarded Croix de Guerre (CdG) by the French Government in recognition of their aircraft leading the opening attacks on D-Day. The citation hangs beside the 550 Squadron Memorial Window in St Denys' Church, North Killingholme. 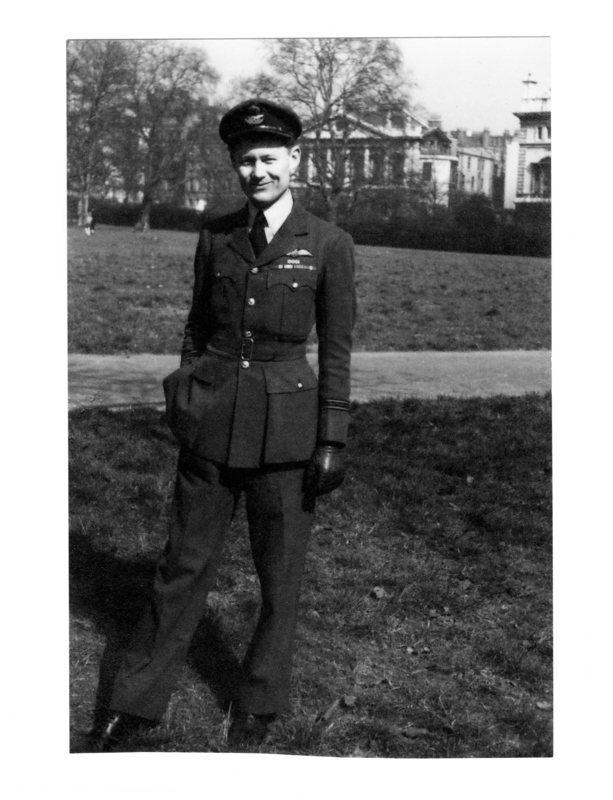 Sgt Davies (F/Eng) was killed when ED730 (pilot Sgt H F J Woods) was involved in a mid-air collision with 100 Sqdn Lancaster (ND327) outbound 23/24 December 1943. 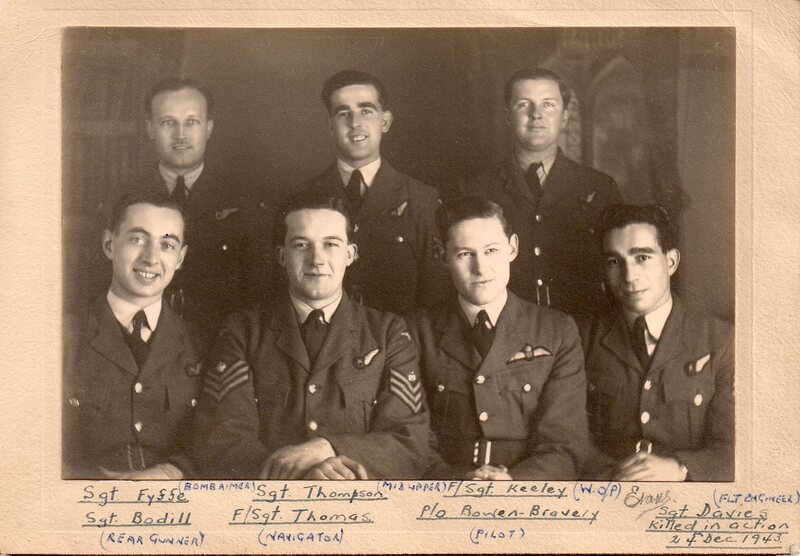 On completion of their tour Bowen-Bravery, Thomas, Fyfe and Thompson transferred out from 550 Squadron on 9th July 1944 (to various destinations). Sgt. Cleghorn transferred out on 27th July 1944. Information about the flight and the target available here. 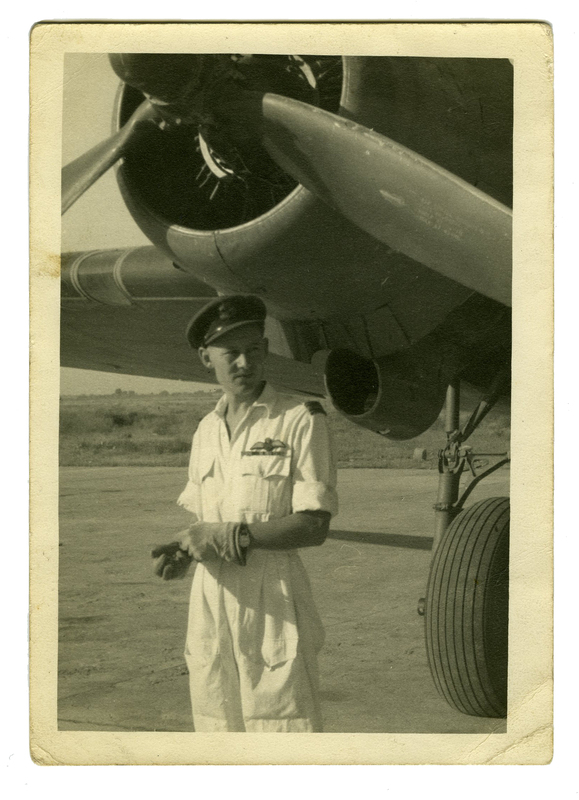 F/O Bowen-Bravery was awarded DFC in September 1944. Kenyon Bowen-Bravery died in September 2013 at the age of 90 and his obituary, attached (left), recalls the part he played in Operation Overlord the greatest liberating armada in military history. He was only 21 years old. "The Man who Started D-Day"
Ward Thomas died in February 2019 at the age of 95 and his obituary, attached (left) was publised in The Times 7th February 2019. 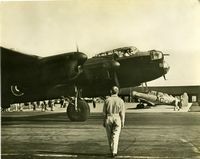 This recalls the part he played in Operation Overlord the greatest liberating armada in military history. He also, after the war, went on to become one of the leading figures in UK independant TV, in particular he founded Yorkshire Television in the Sixties, built colour studios and turned it into a broadcasting powerhouse. Llife in Brief, i Newspaper 11/02/2019.